Every horse owner has experienced the feeling of walking into a pasture to capture a horse and suddenly being surrounded by many curious equines. Suddenly a single 120 pound you is surrounded by a dozen or more “thems” that weigh at least 1,200 pounds. One reassuring fact is that they aren’t carnivores, but still what should you do? The best thing to do is just to ignore them. As you walk past them to get your horse they will realize that there are no treats for them and then they will usually leave you alone. Shove away any persistent horses since it will give them the message that you are not interested in them and then they will generally retreat. You can also let the horses know you don’t want to be fooled with by walking through the pasture with an aggressive, confident posture towards those you don’t want to catch. Of course when catching a horse you should never walk in with a bucket of grain since this is an invitation to being mobbed. Keep any treats hidden in your pocket if you want to give them to your horse. Then when you catch your horse you can give them the treat or you can wait to give the reward once you are outside the gate. It is best to teach your horse to understand that they are rewarded only once they are caught and taken through the gate. If a horse is causing problems in the pasture such as kicking and biting while you are trying to lead away your horse then it will need to be removed. If an aggressive horse threatens people then it needs to be kept out of a pasture situation where there are people. The owner can be liable if there is a horse that is known to be aggressive and it attacks someone that is leading a horse. Legal problems can occur if a horse has a history of being aggressive and then hurts someone in the pasture. Prevention is the key with most problems. Knowing each of the horses that are in the pasture is the best thing. You likely won’t have to worry about going to get your horse if the situation is usual and safe for you. Allow your horse to be happy when they are caught and then this way you won’t have to chase them around the pasture. After catching a horse don’t always ride them hard, rather on occasion catch them and take them inside where you give them a treat and groom them before putting them back out. When releasing the horse back into the pasture it is important to do so calmly. Shut the gate after walking the horse in and then give them a pat after slowly taking off the halter. Without the halter on make the horse stand beside you until you walk away from them. When turning out a horse you should never chase them since this can lead to problems where they will want to race away the moment you loosen the halter. Grab some mane and start scratching a horse’s ears if they want to run off as soon as you loosen the halter. This can help slow them down before they decide to run. A real hazard is a horse that wants to turn around and kick whoever just released them and this should be treated as a major behavioral problem. A harmonious pasture comes from having compatible mates. Your pasture should have enough room to allow you to place you hay in several piles so that horses who are lower in the pecking order won’t be driven away from the food by others. For example there should be seven piles of hay for six horses. You should give enough food so that your horses won’t fight over the food. The pecking order is always going to have a horse on the bottom and this is fine as long as that horse isn’t getting injured. You may have to rearrange your horses if the lowest horse is getting injured. A gelding that thinks they are a stud is one pasture problem. You shouldn’t place this type of a horse in with any mares. This doesn’t mean that all mares and geldings should be separate; rather the geldings that exhibit sexual behavior towards the mares should be kept separate. 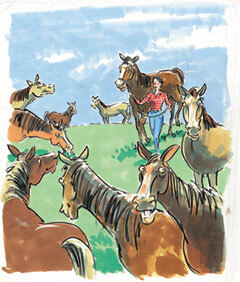 A gelding should be kept separate from the mares if they put their head down and try to hear the mares or you. The sexually aggressive behavior can be reduced with medications if you have no other place to put these horses. You should slowly introduce any new horses to the pasture. It is a good idea to hand introduce a horse over the fence provided you have the facilities and safe fencing. Placing the new arrival in with a soon-to-be-pasture mate in a paddock is one idea to try. For example is you have horses A, B and C out to pasture and you want to add D then you can first place D and C together before adding B and A. This way D won’t be treated so badly. If you must place a new horse in pasture with others because of your facilities then you should at least have a pasture that is big enough to allow the horse to get away if needed. You should also make sure you have safe fences; this is the most important factor that can’t be stressed enough. In order for you to keep an eye on the pasture during the day you should try introducing new horses early in the day so that you can monitor them during the daylight hours in case something goes wrong. Although most of the time horses will get along when they are first introduced. Read the next horse care article on Caring for Your Horse Basics.